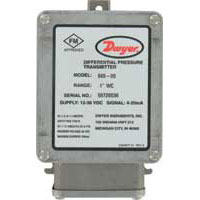 The Dwyer Series 608 Differential Pressure Transmitters convert positive, negative (vacuum), or differential pressures of clean, dry air or other non-conductive, non-corrosive gases into a standard two wire, 4-20 mA output signal. The use of an ultra thin silicon diaphragm enables precision measurement of differential pressures as low as 0.1" of w.c. while withstanding high static working pressures up to 100 psig (6.89 bar). The Series 608 transmitters are FM approved intrinsically safe for use in the specified hazardous locations when used with an approved intrinsic safety barrier. The rugged NEMA 4X, stainless steel housing makes this transmitter ideal for use in industrial and process plant environments. Service: Clean/dry air and compatible combustible gases (see Agency Approvals for FM ratings). Accuracy: ±0.5% or ±0.25% full scale. Pressure Limits: 100 psig (6.89 bar); 15 psid (1.03 bar). Temperature Limits: -20 to 185°F (-28 to 85°C). Compensated Temperature Range: 0 to 160°F (-18 to 71°C). Thermal Effect: 0.5% Accuracy: ±0.02% F.S./°F; 0.25% Accuracy: ±0.01% F.S./°F. Power Requirements: 12 to 36 VDC (2-wire). Output Signal: 4 to 20 mA DC. Loop Resistance: DC: 0-1045 ohms maximum. Electrical Connections: Screw terminals: two 1/2" female NPT conduit. Process Connections: Two 1/4" female NPT. Agency Approvals: FM approved intrinsically safe for use in Class I, Div. 1, Groups A, B, C, D; Class II, Div. 1, Groups E, F, G; Class III, Div. 1 when wire with approved intrinsically safe barrier. Entity parameters: Vmax=36 VDC; Imax=250 mA; C=12 nF; L=0 mH.